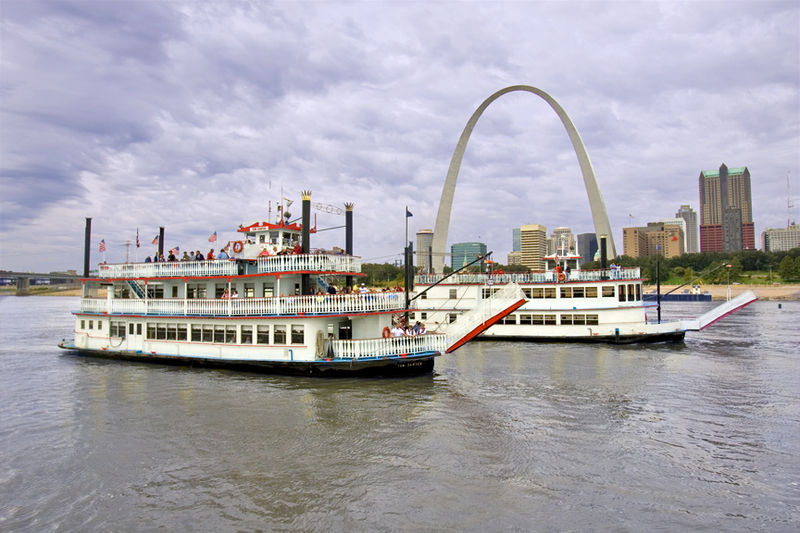 The Gateway Arch Riverboats – the Becky Thatcher and Tom Sawyer – will begin cruising up and down the Mississippi River this weekend with the start of the 2015 riverboat season. Daily, one-hour sightseeing cruises begin Saturday, March 7. These narrated cruises explore the history of downtown St. Louis landmarks and architecture, and the vital role of the Mississippi River to the region. Tickets are $18 for adults and $8 for children ages 3-15 (children under 3-years-old are free). Visitors can save up to $3 by purchasing the Captain’s Combo package, which includes the Sightseeing Cruise and a Journey to the Top of the Gateway Arch tram ticket. 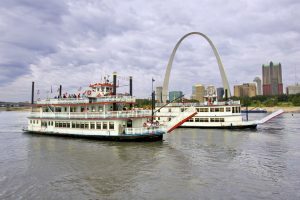 In addition to sightseeing cruises, passengers can take in the sights of the riverfront while enjoying food and music aboard the Skyline Dinner Cruise and Sunday brunch cruises, or dance the night away aboard the Blues Cruise featuring live blues bands on select Thursdays throughout the summer. Reservations are recommended for Sightseeing Cruises and are required for most specialty cruises, and they can be made by calling 1-877-982-1410 or visiting ticketsforthearch.com. For more information about the Gateway Arch Riverboats and the 2015 riverboat cruise schedule, visit gatewayarch.com. Due to the ongoing renovations to the Gateway Arch grounds, guests who are headed to the Gateway Arch riverfront by car should travel east on Chouteau Avenue and then north on Leonor K. Sullivan Boulevard. Parking is available on the levee in front of the riverboats for $4 per vehicle. Visitors who plan to use MetroLink to visit the Gateway Arch are encouraged to exit at the 8th and Pine MetroLink Station and head east toward the Old Courthouse. The only pedestrian entrance to the Gateway Arch grounds from downtown St. Louis is on Walnut Street near the Old Cathedral. 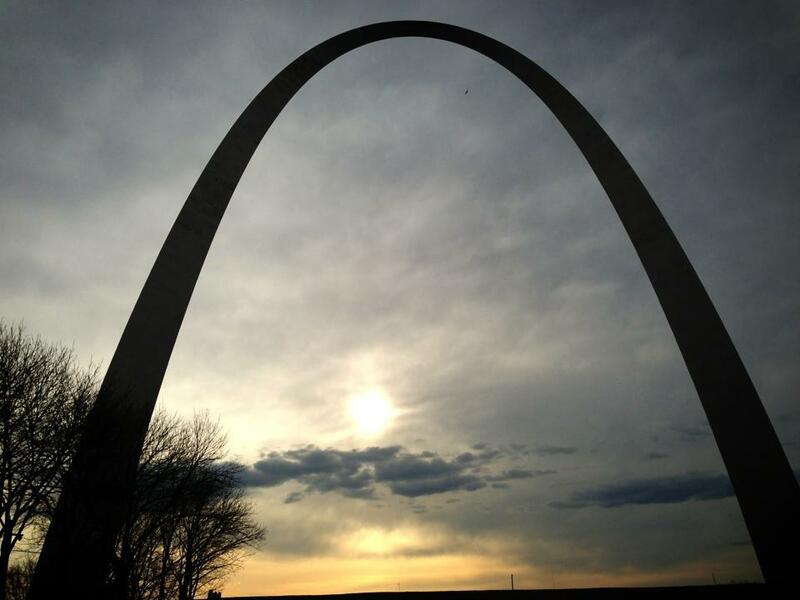 Keep in mind that an entry-only ticket is now required to enter the Gateway Arch. An Arch entry-only ticket is $3 for adults and free for children. This ticket allows access into the Arch facility and admission to Monument to the Dream, a documentary that showcases the construction of the Gateway Arch. A Journey to the Top ticket, $10 for adults and $5 for children ages 3-15, includes a tram ride to the top of the Gateway Arch, as well as access into the Arch facility and admission to Monument to the Dream. All Gateway Arch visitors may purchase tram ride tickets and entry-only tickets online, by phone at 1-877-982-1410 or in person by visiting the Old Courthouse, located at 11 North Fourth Street in downtown St. Louis, which is serving as the Gateway Arch Ticketing and Visitor Center during construction. While same-day tickets may be bought in person, visitors are strongly encouraged to purchase their tickets prior to the day of their visit to ensure entrance to the Arch.